This is your last stand. Imps are pouring through the door on the left, while slugs worm their way through the vent in the corner. Two team-mates are dead, another is a mere faltering heartbeat within a crumpled body at your feet. You’re alone in this hell with just a handful of shotgun rounds to fire and seconds to live. 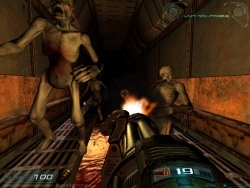 But if being the last man standing isn’t always a prize worth fighting for, this forthcoming Doom 3 mod certainly is. Far from a total conversion, Last Man Standing will simply take id’s environments and build closed, claustrophobic arenas, with demons oozing through every imaginable orifice. You’re going to sink eventually; the only question is how long you can swim? “We’re aiming to incite panic in the players,” says mod leader Michael Tomaino, menacingly. Thankfully, you won’t always be alone. The mod will have cooperative play as well as single-player, which will mean you can put your life on the line alongside your friends. “We’ll add more monsters to the map depending on how many players there are,” warns Tomaino. An old favorite, the double-barreled shotgun, will return, upgraded for the job at hand alongside a ‘plasmathrower’, which Tomaino describes, unsurprisingly, as “a flamethrower that launches bursts of blue plasma”. We’ll also be able to ‘hack’ doors to seal them off. The onus, however, will be on the team-mates, who must fight desperately to defend the hacker while he closes the entry points. Think of all the nightmare scenes in Aliens: doors being sealed with seconds to spare as xenomorphs throw their bodies against metal. 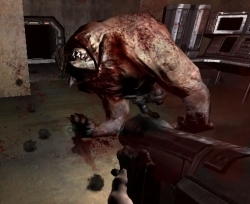 As in Cameron’s movie, players can also deploy sentry bots and turrets to pin the beasts in corridors. 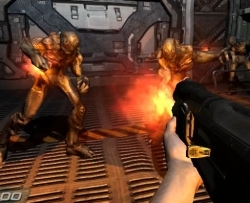 In the primary game (singleplayer or co-op), your task is simply to stay alive and waste a designated number of psycho-morphs. In the competitive mode, the stream of monsters never ends, and the last man standing is the winner by default. A third mode currently being debated by the team will involve players competing in a suicide mission to rack up kills – with a ticking timebomb strapped to their torso. Death is inevitable, but then Last Man Standing is all about going out with a bang – with a grin plastered across your chops.